IRS released aggregated Country-by-Country Reporting (CbCR) data from large US-headquartered multinational enterprises (MNEs) from 2016, the initial year of the OECD/G20 BEPS transparency implementation. [Link] The six tables provide a first look at CbCR data from US MNEs, which show some of the insights as well as limitations of the reported data. 1,101 US corporations and partnerships filed Form 8975 for 2016. Additional US MNEs are expected to file in 2017, the first year of mandatory reporting. The reporting MNEs had global revenue in excess of $850 million. The US ultimate parents had 26,473 constituent entity subgroups in separate jurisdictions. The total number of constituent entities was 154,000, with roughly 54,000 entities in the US and 100,000 entities outside the US. Given the aggregation in the CbCR template, multiple entities in a single country are combined into subgroups for reporting purposes. Form 8975 data filed by 14 foreign controlled domestic corporations are not included in the tables. As the OECD/G20 BEPS Action 13 states: “The Country-by-Country Reports will be helpful for high-level transfer pricing risk assessment purposes.” It goes on to say: “It may also be used by tax administrations in evaluating other BEPS related risks and where appropriate for economic and statistical analysis.” The IRS should be commended for releasing these aggregated tabulations, prior to the inclusion in a forthcoming OECD Corporate Statistics publication with other countries’ CbCR data. With the consideration of revised profit allocation and nexus rules and a global anti-base erosion proposal [Link], the CbCR data will provide significant incremental insights into MNEs’ business and tax activities. Effective Tax Rates. The table below shows 950 US MNE groups had 4,246 subgroups in jurisdictions with positive profits yet effective tax rates less than 5%. These subgroups accounted for 18% of revenue, 48% of net profits, and only 3% of income tax accrued. $689 billion of profit was earned by profitable MNE subgroups with ETRs less than 5%. Their profits were 24% of their total revenue and 52% of their tangible assets. 322 (or 29%) of the MNEs groups reported profitable “stateless entities” which earned $142 billion of income (18% of total non-US net profit) and paid only $700 million in foreign income tax (an effective tax rate of 0.6%). The OECD instructions required a separate line for all constituent entities in a MNE group deemed by the reporting MNE as not resident in any tax jurisdiction for tax purposes. These include “fiscally transparent” entities or “ghost companies,” such as Apple Sales International that earned tens of billions of income not reported to any tax authority several years ago since it was incorporated in Ireland but managed and controlled from the U.S. The CbCR data reports over 10,000 stateless entities controlled by US MNEs. Some of the stateless entities are pass-through partnerships, but significant untaxed income didn’t flow to related parties. Domestic vs. Foreign Activity. The CbCR data includes parents and domestic affiliates in the US as well as US MNEs’ subsidiaries and branches in other countries. The table below shows the largest US MNE’s for their profitable entities reported 65% of their revenue as received in the US and 56% of their total profits earned by US entities. [84 of the 1,101 US MNEs did not report activity in the US, which is likely a data issue in the first, voluntary year of implementation, but which would overstate non-US activity since calculated as All Jurisdictions less U.S..] The profitability of the US entities was lower than their non-US entities. The ratio of profit to total revenues was 10.5 for US entities versus 15.5% for their non-US entities. The ratio of profit to tangible assets was 27.8% for US entities versus 52.8% for non-US entities. One cause of that difference is likely the shifting of intangible assets out of the US to jurisdictions with lower tax rates. In addition, the ETR for US entities was twice that of the non-US entities (18.9% and 9.6%, respectively). CbCR vs. Other MNE Data. US government data on US multinationals has been extensive and best in class, so the CbCR reports will be most helpful in other countries. The US publishes tax return data from the Form 5471 from Controlled Foreign Corporations. [Link] The US Bureau of Economic Analysis publishes data on the Activities of Multinationals Enterprises (AMNE). [Link] The table below shows selected comparisons of the Form 5471 data (from 2014) and the Form 8975 data (from 2016). Since only MNEs with global revenues exceeding $850 million file the Form 8975, the total amounts reported on the Form 8975 are lower. The relative effective tax rates for the Caribbean island havens and Ireland are flip-flop, likely due to different years, different MNEs included, or different reporting measures. Academics have noted the concentration of foreign income of US MNEs from Caribbean islands, Ireland, Luxembourg and Switzerland, accounting for 63% of total foreign income from the BEA AMNE (2016) and 59% of total foreign income from the Form 5471 (2014). The CbCR data show only 24% of total foreign income from those countries as reported by the largest US MNEs in 2016. Reasons for the difference are worth pursuing as well as reasons for the negative net income reported from US MNE affiliates in Luxembourg and Switzerland. Opportunities. The new CbCR data provides some important insights into the business and tax activities of the largest MNEs. Tax administrations will be able to use it for high-level transfer pricing enforcement, more efficiently identifying issues for further examination. Statistical and economic analysis of the aggregated data will help policymakers and policy analysts understand additional dimensions to MNE activity, such as stateless entities and low ETR entities. For example, estimates of so-called residual profits in excess of a return on tangible assets (similar to the new U.S. Global Intangible Low Taxed Income provision) can be calculated. As more analysts examine the new US CbCR data tabulations additional insights as well as questions for further data collection and analyses will emerge. As CbCR data for other countries are tabulated and published by individual countries or the OECD, it will be important to determine if stateless entities and low ETR entities are as prevalent in non-US MNEs. They will also provide additional information to supplement the IRS Form 5472 data on foreign-owned US corporations. Limitations. Aggregated tabulations limit the number of dimensions that can be explored analytically. Due to confidentiality issues, other countries will not be able to provide the same granular detail as the U.S. with its 1,101 ultimate parents reporting. The US CbCR data fortunately included tabulations for profitable entities, rather than limiting tabulations to net income (profit less losses), which is not a good a measure of taxable income. The new data is for a snapshot in time. It will be important to use the CbCR data to analyze changes over time as the BEPS minimum standards and national anti-base erosion rules take effect. For example, what would the data have shown in 2013 before the BEPS Project and the anticipation of such transparency? Aggregated results can prevent accurate measurement of distributions, such as low ETRs. For example, the ETR tabulation reports that $689 billion of income was subject to an ETR of less than 5%. By contrast, tallying the country distribution of profitable entities with an average ETR of less than 5% results in only $318 billion since entities with low ETRs are located in countries with higher average ETRs. The data does not help analysts understand why ETRs are low or high. Low ETRs could be due to low statutory tax rates, special deductions or exemptions, tax credits, or aggressive tax planning. Additional analysis with other data is needed. Progress. Kudos to the IRS Statistics of Income Division for its timely release of the initial US Country-by-Country Report tabulations with tabulations helpful to both tax administration and tax policymaking. The OECD/G20 BEPS Action 13 Transfer Pricing Documentation and Country-by-Country Reporting is now a minimum standard of the 129-member BEPS Inclusive Framework. The increased transparency of MNEs’ business and tax activities is a significant step forward in reducing tax-induced profit shifting. I look forward to the release of other countries’ CbC reports and future years’ reports to track changes in BEPS over time. The OECD’s first Corporate Tax Statistics publication is a useful compilation of prior OECD corporate tax statistics, plus extension of some statistics to close to 100 countries participating in the BEPS Inclusive Framework. It is a first step in what hopefully will be a more in-depth database and analyses of domestic and cross-border business taxation. The report includes statistics on corporate tax collections, statutory marginal tax rates, effective tax rates, R&D tax incentives, and intellectual property tax regimes. The OECD has previously reported much of this data in other publications. The data on total corporate tax revenue is missing two important factors from the OECD’s estimation of the annual global revenue loss from Base Erosion and Profit Shifting (BEPS). First, one needs to know how much total corporate tax collections come from purely domestic companies compared to multinational enterprises. Some countries, such as the U.S., have a good breakdown, but most countries could not provide the breakdown to the OECD for the 2015 BEPS Action 11 report. That information is available for the largest MNEs operating in each country from the Country-by-Country Report (CbCR) data. Second, the tax revenue data is after tax credits. In some countries, tax credits for various policy initiatives reduce corporate tax collections by 30%. For cross-country comparisons of corporate tax and comparisons of collections with statutory and effective tax rates, presentation of corporate tax collections both before and after tax credits would be beneficial. The presentations of many statistics are based on the simple count of number of countries and unweighted averages. That means the U.S. and China are treated the same as Estonia and the Isle of Man. Average corporate tax rates, weighted by GDP, foreign direct investment, or exports/imports, are higher than unweighted averages that give equal weight to large and small economies. The report notes why the ratio of corporate income tax to total revenues and GDP are influenced by a number of different factors. Hopefully future reports will compare corporate income tax to a better proxy of corporate income, such as national statistics’ corporate operating surplus. The statistics on R&D incentives are from the OECD Directorate for Science, Technology and Innovation, which have been presented for years. The R&D tax incentives do not include the revenue lost from special low rates on “patent boxes”. Hopefully future reports will collect and add that information. More detail on the tax rates and bases of both R&D tax credits and “patent boxes” would be helpful. The new report is an important first step since the forthcoming CbCR data should not be viewed in isolation to general corporate and cross-border business taxation. The CbCR data will definitely improve policymakers’ view of multinational enterprises’ activities in their countries, such as the mix of corporate revenue from purely domestic and large multinational enterprises, and key relationships between the financial statistics. The CbCR will also include data of large non-corporate global businesses. The CbCR data, however, will not be a panacea since the reports’ template doesn’t include intra-company royalties or interest, and BEPS will still need to be estimated to separate real economic effects of tax rate differentials from profit shifting. Individual countries should be encouraged to release unilaterally their CbCR aggregated tabulations in the format requested by the BEPS Inclusive Framework for OECD publication. In the case of the United States, fairly similar data is available from the Form 5471 from US-headquartered multinationals and their foreign affiliates. A comparison of the Form 5471 data with the CbCR data will highlight similarities and differences. 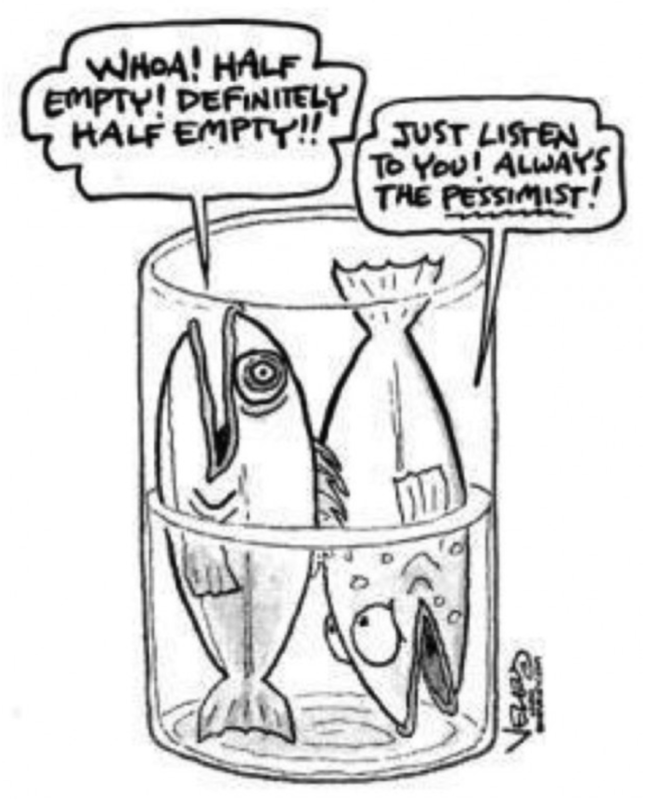 The OECD’s first Corporate Tax Statistics publication might be considered a report half-empty or half-full, since only the extension of corporate effective tax rate statistics to a larger number of countries is new data. Pulling together data in one publication and database is helpful, but also highlights how much more policymakers and policy analysts need to know about corporate and international business taxation. With the addition of future CbCR data and additional statistical measures, future publications will be even more worthwhile. Sacha Wunsch-Vincent of the World Intellectual Property Organization (WIPO) and I have a forthcoming chapter in a World Trade Organization (WTO) book which extends our analysis of tax distortions in the location of intellectual property. Not surprisingly, low tax rates have encouraged the assignment of intangible income by multinational enterprises to countries with low effective tax rates. The bad news is that tax-motivated profit shifting has distorted reduced governmental revenues and distorted national statistics. The good news is that such distortions will be reduced in the future due to collaborative governmental policies. The OECD/G20 BEPS project addressed the disconnect between the location of taxable income and the location of value creation. The project instituted standards to prevent harmful tax competition, updated standards for tax treaties and transfer pricing, and instituted new country-by-country reporting of MNEs for improved transfer pricing administration, among other changes. Information from the World Development Indicators on cross-border charges for the use of intellectual property (CUIP) has not previously been used to assess profit shifting from transfer mispricing and the strategic location of IP, which have been estimated to be the main channels of base erosion and profit shifting. Cross-border IP receipts should be strongly related to prior R&D expenditures. A simple analysis examines whether corporate tax rates, including tax rates for certain intangible income, affects the relationship of cross-border IP receipts and prior year R&D expenditures across countries. The figure above shows a high ratio for several countries with low tax rates or tax regimes providing low effective taxation of IP. Luxembourg, Netherlands and Ireland have ratios exceeding 175% while Japan, Germany and the U.S. have ratios below 25%. Profit shifting, not real economic activity, explains the vast differences. Regression analysis of CUIP, R&D, outbound FDI and tax rate data for 29 OECD countries from 2005 to 2016 finds that a one percentage point lower tax rate on IP income increases the ratio of IP income to lagged R&D expenditures by 5-7 percent. This is consistent with other empirical findings showing greater transfer mispricing in R&D intensive sectors and the strategic location of IP in countries with low tax rates. Non-tax explanations can not fully account for the consistent pattern of higher IP receipts relative to prior year R&D expenditures recorded in countries with lower tax rates. Future research could use this type of data to determine if the OECD/G20 BEPS project and implementation of anti-avoidance rules by countries since 2014 are reducing tax-motivated distortions in the IP flows and national statistics. The regression finds the general corporate tax rate to be statistically significant, but with a larger effect when the intangible tax rate is used. The differential between the general and intangible tax rate has a larger effect than the intangible (favorable “patent box”) tax rate by itself. The ratio of countries’ outbound foreign direct investment (FDI) to GDP is positive and statistically significant. High relative outbound FDI is expected to be associated with greater cross-border activity, but also reflects countries with significant Special Purpose Entities (SPEs), which often facilitate tax planning. A number of alternative specifications were tested. The last column shows when CUIP as a percent of GDP is an absolute rather than a ratio to lagged R&D expenditures, with a slightly larger tax differential effect. Time fixed effects don’t affect the size of the coefficients. The coefficient on the tax rate differential variable declines with country fixed effects, suggesting most of the effect occurs across countries rather than within individual countries. Reductions in a country’s tax rate on IP income increases the amount of cross-border IP income relative to its lagged R&D expenditures. Most likely that effect is driven by tax-motivated profit shifting across countries than increasing total returns to global IP investments. Lower general corporate tax rates and non-harmful competition tax rates on IP income in countries with real R&D activity, such as the 2017 U.S. tax reform, should reduce the current shifting of IP and IP income out of the those countries. A number of countries have, or are proposing, new taxes on digital services where user participation, user data, or user generated content is significant. These taxes are targeted at a small number of large multinational corporations whose users provide data or content in exchange for “free” digital services, such as search, email and/or data storage, and the user data is then sold for targeted online advertising. These tax proposals likely miss most of the untaxed income and services. Information reporting or withholding by digital intermediaries, such as Uber and AirBnB, would improve tax compliance rates by household suppliers of these services. Taxing the barter income and payments of digital platforms, such as Facebook and Google, would raise revenue while reducing economic distortions. Ensuring digital services and goods are subject to countries’ value-added taxes would help level the playing field with domestic and non-digital suppliers. The European Union and the United Kingdom, among others, have recently proposed interim digital services taxes prior to the G20/OECD BEPS Inclusive Framework countries reaching a more comprehensive international agreement on the corporate taxation of digital businesses. The proposals are excise taxes on certain cross-border revenue of certain digital businesses. The OECD’s 2018 interim report, Tax Challenges Arising from Digitalization, notes significant differences of opinion about the contribution of user data and content to the value creation (and taxable income) of multinational corporations. Agreement on a “digital presence” permitting countries to tax multinational companies that have many users in a country is likely, but how much income to attribute to their contribution is quite controversial. Some countries think user participation is a new factor integral to companies’ value creation. A second group of countries think user participation contributes to intangible assets used by companies in their value creation. While a third group of countries think user contributions are similar to business inputs purchased from independent third parties, and thus are not part of a company’s corporate profits. The focus to date has been principally on international corporate income taxation. However, the largest potential tax revenue from digital economic activity, similar to non-digital economic activity, is in personal income taxation and indirect taxation (value-added taxes). The OECD BEPS Project recommended using the destination principle for determining the place of taxation of cross-border supplies and approaches for more effect VAT collection on the growing volume of imports of low value goods from online sales. This is already resulting in increased VAT revenues. Although politicians prefer to tax foreign companies, if they are serious about the potential revenue from untaxed income generated by user data and user content, they should focus on personal income taxation. In the multi-sided business model of social networks, users receive “free” digital services, such as email, search and data storage, in exchange for providing user data, which is then available to the digital business to sell targeted customer advertising. 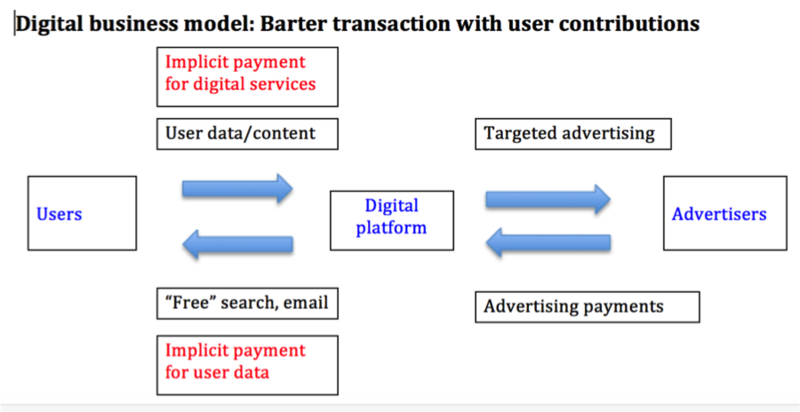 In these barter transactions, users provide valuable data without recognizing any (taxable) income and without paying any monetary consideration for the digital services. This is shown in the above diagram. The value of these individual barter transactions may be relatively small, say $5 per month, but in the aggregate, could be quite large. If there are 500,000 users using a network, the annual barter income could be $30 million. Instead of a 2% or 3% excise tax as envisioned in the UK and EU proposals, the average income and social security contribution rate for an average wage earner in OECD countries was 25% in 2017. Taking into account employer social security contributions as well, the all-in average tax rate on labor income of an average wage earner was 36%. The average VAT rate in OECD countries is 19%. Collecting tax on relatively small amounts of “imputed” income of households does not make administrative or economic sense, but a close proxy for such a tax could be collected at the business level using an average personal income tax rate. The tax could be collected from any business, above a threshold, providing “free” digital services in exchange for user data or content, based on the value of providing such services to a country’s users. A proxy tax on the personal income earned from providing data and user content to digital businesses, collected at the business level, has more justification than an arbitrary excise tax on certain business services as a proxy for taxing corporate income of digital companies. Additional revenue consistent with income and indirect tax principles is possible with information reporting and/or withholding on digital intermediary companies, and with a business proxy tax for barter payments of digital platform companies. I had the pleasure of working with Agustin Redonda of the Swiss think-tank, Council on Economic Policies (CEP), on the institutional issues of tax expenditure reporting in the G20 and OECD countries. The new CEP working paper, Assessing Tax Expenditure Reporting in G20 and OECD Economies, is available at this <link>. Although there are many issues with the identification, valuation and cross-country comparisons of tax expenditures, there should be little question about the importance of countries being transparent in their reporting of these government incentives and subsidies. We analyze 11 dimensions of tax expenditure reporting, and divide countries into three groups: non-reporting, basic reporting, and detailed comprehensive reporting. There is significant room in all countries to improve the transparency and analysis of tax expenditures. Agustin has compiled a Global Tax Expenditure Database for these countries, so you will see more information soon about countries use of their tax systems in ways that could be done through direct expenditures or government lending. Two recent reports discuss the benefits of increased and more in-depth analysis of tax expenditures: government spending done through lower tax rates, credits, deductions, exemptions and deferrals. The Swiss-based Council on Economic Policies blog, which I co-wrote, discusses the importance of tax expenditure reviews as part of the United Nations’ Sustainable Development Goals. While important for developing countries, even OECD/G20 countries fall well short of transparency and evaluation benchmarks. See link. The Urban Institute released a study describing the minimal analysis of tax expenditures and suggesting some options to enhance the evaluation of effectiveness of US tax expenditures. See link. Although some people cite conceptual and measurement issues as reasons not to undertake more analysis of tax expenditures, some key institutional best practices could provide more empirical-based analytics of the effectiveness of these government subsidy programs. 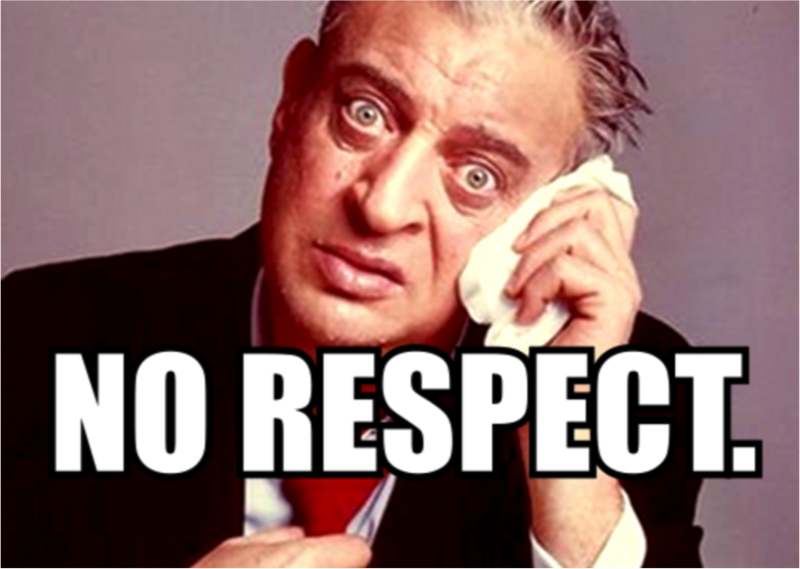 To paraphrase Rodney Dangerfield, tax expenditure analysis gets no respect. As an example of no respect, a bill sponsored by Ways and Means Committee ranking member Sander Levin, in the “American Jobs and Closing Tax Loopholes Act of 2010”, called for systematic study of tax expenditures. The provision required the Chief of Staff of the Joint Committee on Taxation, in consultation with the Comptroller General, to submit to the House Ways and Means Committee and the Senate Finance Committee a report on each tax expenditure. Reports for each tax expenditure “are to be submitted first, in order from those with the least aggregate cost to the greatest aggregate cost.” See link, page 123. As countries face increasing fiscal deficits and pressing social needs, hopefully increased focus on the effectiveness of tax expenditures will get more attention and respect. Expect more studies like these to start focusing on the importance of evaluating tax expenditures. Joel Slemrod began the University of Michigan’s Office of Tax Policy Research in 1988, and this weekend celebrated its 30th anniversary with an excellent conference. OTPR has become one of the top academic forces in global tax policy and tax administration with its many publications, conferences, and its outstanding tax scholars that now are several professional generations old and growing. Over ninety PhDs in tax areas have emerged from OTPR and are now at the U.S. Treasury’s Office of Tax Analysis, the Joint Committee on Taxation, the Congressional Budget Office, many other countries’ finance and tax administrations, as well as other important academic and non-government institutions. Mary Ceccanese (30 years) and Jim Hines (20 years) have also been instrumental in OTPR’s success. I was fortunate to be the moderator of the conference’s first roundtable on global tax policy issues with a premier panel including Alan Auerbach, Richard Bird, Michael Devereux, Jim Poterba and Harvey Rosen. The session covered many topics, including the future of destination-based taxation, the principle of value creation in the context of non-digital and digital tax, the “growth” vs. “redistribution” lens on tax policy issues, Musgravian “stabilization” policy, and developing countries’ issues including tax administration and political economy. I highly recommend the 90-minute video of this roundtable, which can be viewed at this LINK. The other roundtables and the paper presentations on the second day demonstrated the quality and breadth of OTPR’s research and policy/administration contributions. Congratulations to Joel, Mary, Jim and all of the OTPR family on an amazing first 30 years and many more in the future. Richard Rubin of the Wall Street Journal quotes me in a new article noting that the U.S. is no longer going to be a chump in terms of profit shifting out of the U.S. 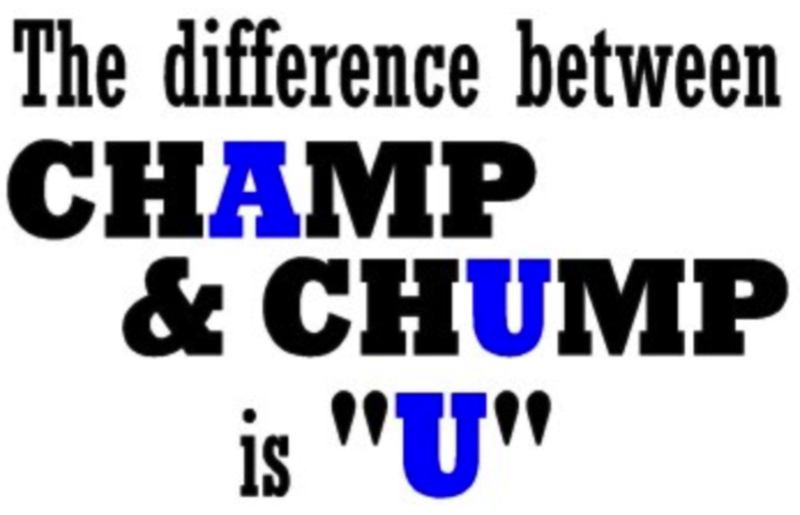 I like the vocabulary.com definition of chump: Chump is a very informal word for someone who falls for every trick and scheme, or who believes everything you tell them. If you get an email from an African prince asking for your bank account information so he can give you a lot of money, and you respond excitedly, ready to collect the cash, you're a chump. The 2017 tax law change not only reduced the federal corporate tax rate to 21%, but also enacted a number of rules consistent with the OECD/G20 BEPS Project. These include anti-hybrid rules (BEPS Action 2), the so-called GILTI alternative minimum tax (AMT) on foreign source income (tightening controlled foreign corporation (CFC) rules, BEPS Action 3), excess interest deduction limitation (BEPS Action 4), a tougher intangible transfer pricing rule (BEPS Action 8-10) and a new tax on certain related party payments susceptible to transfer mispricing. These anti-BEPS provisions are estimated by the JCT to raise more than $600 billion over ten years. The Congressional Budget Office’s April 2018 Budget and Economic Outlook estimates that the 2017 tax changes will reduce profit shifting out of the US by over 20% ($65 billion out of an annual $300 billion). The lower tax rate reduces the incentive for many multinational enterprises (MNEs) to stop locating debt in their US subsidiaries or headquarters and reduces the incentive for transferring intellectual property (IP) out of the US. The CBO claims that only “a small portion” of the reduced profit shifting is from transfer mispricing, although transfer mispricing occurs with debt as well as IP transfers. At a 35% corporate tax rate, $300 billion of profit shifting resulted in a $105 billion annual revenue loss. At a 21% rate, it falls to $63 billion. A $65 billion reduction at 21% will increase US revenues by $14 billion annually. A $14 billion annual pickup seems low given the 21% corporate tax rate plus the other anti-BEPS provisions. Ireland with a 12.5% corporate rate, countries with lower “patent box” tax rates, and Caribbean tax havens remain, and the move toward a territorial system (100% dividend exemption) even with the foreign source income AMT, means some companies at some margins will still have an incentive to shift taxable income out of the U.S. In other cases, now there will be some companies at some margins shifting taxable income into the U.S. Thus, I am more optimistic than the CBO is about the potential positive effects of the US tax changes on MNE economic decisions towards US activity once the uncertainty of the new rules is reduced and the positive effects on reduced profit shifting. One reason that the $65 billion of reduced profit shifting might be reasonable is the US tax change is occurring after the meaningful changes following the OECD/G20 BEPS Project and its on-going implementation by the 113 country BEPS Inclusive Framework. The Country-by-Country reporting by almost 10,000 MNEs of their profits, taxes and certain economic activities across countries provides important transparency to tax administrations, and is expected to reduce egregious transfer mispricing. The revised OECD transfer pricing guidelines will eliminate the so-called “cash boxes”, where significant intangible income is assigned to a subsidiary in a low-tax-rate country despite minimal economic activity other than financing graciously provided by the parent. The BEPS Inclusive Framework is enforcing one of the BEPS minimum standards requiring actual economic nexus to benefit from special low tax rate for “patent boxes” or other “tax subsidies”. The U.S. continues to be an active participant in the OECD BEPS Inclusive Framework. Even with a 21% corporate tax rate, the U.S. will need to be on close guard to combat continued attempts at profit shifting as well as closing new unintended tax minimization opportunities that will definitely arise. Although new data to analyze the reduction in profit shifting won’t be available immediately, the playing field in international tax planning is no longer tilted strongly against the US. The US is no longer easy picking for international tax planning. The U.S. is not yet a champ in the international tax area, but it is no longer a chump. A new European Commission (EC) proposal to impose a temporary 3 percent excise tax on certain digital services “characterized by user value creation” of large social media and platform companies raises a number of important issues. The EU proposal release comes a week after an excellent OECD interim report on Tax Challenges Arising from Digitalisation. The OECD report notes the current lack of an international consensus on a long-term solution to international tax rules dealing with the ability of countries to tax (“nexus”) foreign companies and the attribution of global profit from certain digital activities between countries. The EU proposal is intended to better measure the location of a multinational company’s income where “user generated contents and data collection have become core activities for the value creation of digital businesses.” Although the OECD/G20 BEPS project addressed the potential of double non-taxation from digital services, the project did not address to which countries the appropriate income tax on digital services should be paid. The new OECD report outlines a dozen countries, including the United States, that have imposed unilateral measures affecting cross-border digital services. The 113 countries participating in the BEPS Inclusive Framework all agree to work towards a consensus based long-term agreement on the tax treatment of digital services but are currently split on whether and which type of long-term agreement is needed and whether interim steps are needed before a long-term agreement is reached. The EU digital tax proposal is a further manifestation of tax policy arguments to allocate some global income based on the location of consumers. The EU proposal for a Common Consolidated Corporate Tax Base would allocate corporate income tax within the EU based on the location of consumers, tangible assets and employees. The EU comprehensive proposal on digital services suggests a different profit split allocation for function with a significant digital presence (e.g. R&D and marketing expenses, number of users and digital data collected). The U.S. and Canada at the subnational level allocate corporate income between states and provinces based on sales, payroll, and/or tangible capital. China has argued in transfer pricing cases that more income should be allocated based on the use of IP in the domestic market. India was the first to introduce an equalization levy on digital advertising revenue attributable to Indian consumers. The OECD report provides a thorough analysis of the types of digitalization activities that give rise to both income and consumption tax issues. These include two-sided markets, where a social media platform can earn additional advertising revenue as a result of the personal data provided by users benefiting from “free” digital services. The user data is an important intangible capital asset of digital companies but is generally not recognized as a factor in whether a company has a “permanent establishment” in the country to justify being subject to tax. 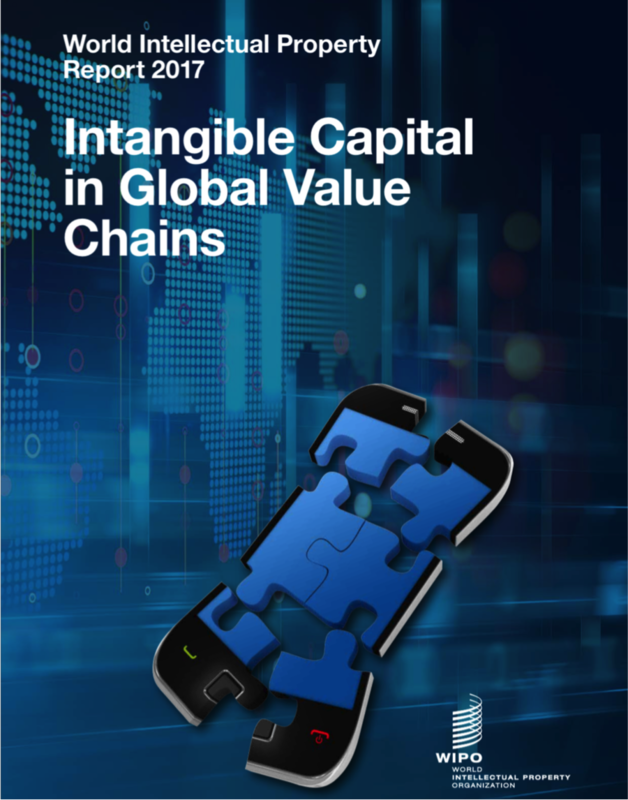 The intangible capital from user data is not included in the current profit allocation of the arms’-length transfer pricing rules based on assets used, functions performed and risks assumed. Most of the focus on the BEPS project has been on its efforts to stop double non-taxation of corporate income. In addition, the BEPS project included significant improvements in the consumption taxation of cross-border service supplies in both the business-to-business (B2B) and business-to-consumer (B2C) markets. The EU is now collecting an additional 3 billion euros annually in Value-added Taxes (VAT) as a result of implementing the BEPS recommendations of revised International VAT/GST guidelines, which more effectively applies VAT to cross-border digital services. Neither the EC proposal nor the OECD report discuss lost consumption tax revenues from the significant value of “free” digital services. Lost VAT revenue at an average EU OECD members’ VAT rate of 22% on gross receipts is significantly greater than any lost corporate income tax (CIT) revenue at an average EU OECD members’ CIT rate of 23% on net income (even if the net income is 40-50% of gross receipts). No explanation for the EU’s choice of a 3% tax rate on gross receipts was provided. Although it is difficult to impose tax directly on “free” services, such as employee fringe benefits or bank checking services, public finance economics concludes that in many cases it doesn’t matter whether the tax is imposed on or collected at the seller or consumer level. Thus, a tax at the company level may be a rough proxy for the income tax and/or consumption tax that ideally would be collected on the barter income of digital users and/or on the value of “free” consumer services. The August 9, 2016 blog described an appendix in the BEPS Action 1 report prepared by the Tax Sages on the incidence of taxes on foreign sellers (without permanent establishment) of digital services. A final OECD report on tax issues from digitalisation is due in 2020, with the goal of moving closer to a long-term international agreement to international tax rules for digital services. The OECD/G20 BEPS Country-by-Country reports will also be reviewed and potentially changed in 2020. Greater transparency on where companies are operating beyond total revenues, tangible capital and employees would help assess the location of income by country not only for tax administrations but for assessing cross-border digital services as well as national income statistics. A recent conference by The Platform for Collaboration on Tax was held on how taxation is an important part of the United Nations’ 17 Sustainable Development Goals (SDG). World leaders adopted the goals at a UN summit in the fall of 2015. The goals are to end all forms of poverty, reduce inequalities, while protecting the planet. The Platform is a collaboration of the International Monetary Fund (IMF), the Organization for Economic Co-operation and Development (OECD), the United Nations (UN) and the World Bank Group (WBG). The conference highlighted that tax structures affect more than just financing government, but also affect equality, investment, growth, environment and other SDG goals (and their 230 indicators). It is exciting to hear about enhanced international cooperation in standard setting, capacity building and technical assistance. Teaming among the key four international tax organizations, with several regional tax organizations, and the active involvement of developing and developed country tax policy officials and tax administrations, with business and civil society groups, is encouraging. But it is only the beginning of a long and politically difficult journey. There is some positive progress. Now there are 112 countries participating in the base-erosion and profit-shifting (BEPS) Inclusive Framework, up from the initial 44 countries. All 112 countries have signed on to implementing the four BEPS Project minimum standards, including country-by-country reporting of multinational enterprises. Further progress on curtailing BEPS and providing technical assistance to implement anti-BEPS measures is a work-in-progress. 148 countries are participating in the Global Forum on Transparency and Exchange of Information for Tax Purposes, which not only has begun Automatic Exchange of Information between countries on financial assets held by their citizens in foreign countries, but also making progress on greater transparency on the underlying owners of different types of business arrangements. A number of countries raise less than 15 percent of their GDP in taxes, which is considered insufficient to finance basic government services for their citizens. Domestic resource mobilization requires increased tax administration capacity as well as properly designed tax structures. Many countries have large “informal” sectors, which don’t participate in the tax system or other government programs. Corruption and bribery undermine trust in governments and contribute to large illicit financial flows out of many countries. While focusing on multinational corporations and reducing BEPS is important, the stakeholders need to recognize that corporate income tax and legal tax avoidance is only one of many tax policy and tax administration issues that need addressing for developing countries’ domestic resource mobilization. Issues of taxing rights of individual countries is not just a developing country concern, but also of developed countries, as seen in the emerging debate on the international tax effects of digitalization of the global economy. 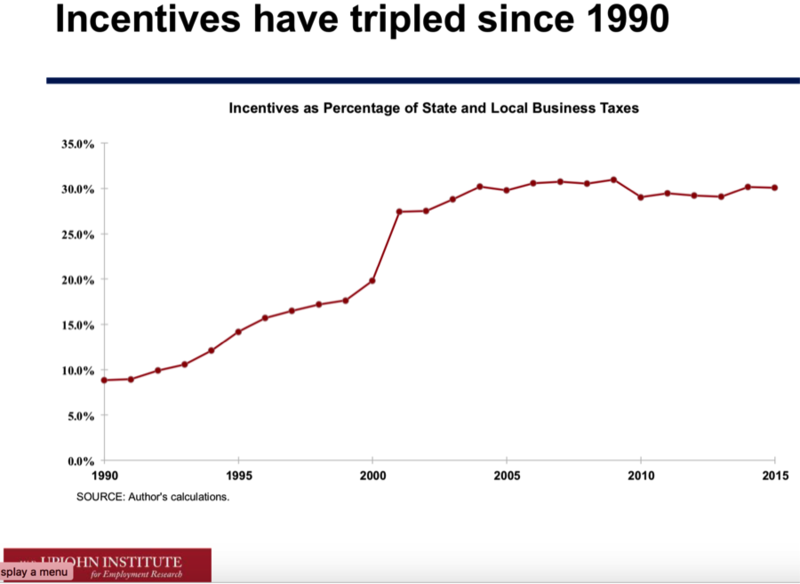 The race to the bottom in tax incentives, base erosion through tax expenditures, and significant tax gaps from non-compliance and evasion need addressing. Higher levels of tax must be achieved in the context of promoting economic growth, reducing tax uncertainty, and reducing inequality. Designing better tax structures, strengthening tax administration capabilities, and supporting statistics and analysis for continuous improvement are foundational. There is no shortage of important tax policy and tax administration issues for all stakeholders (and young tax professionals) to work together in making progress toward the critical sustainable development goals. There is also no time like the present to start taking specific actions by individual countries. The Platform’s first global conference is a useful first step, and hopefully the next conference will report even greater progress by the Platform and individual countries. All government spending and tax incentive programs provide some benefits to economic activity that would take place without the incentive. I'm skeptical of attempts to increase the "bang for the buck" with so-called incremental tax incentives. I disagree with critics of general tax rate changes who prefer special incentives rather than general tax rate changes. But giving tax money away for activity which has already taken place, with no positive future economic benefits, is a waste of badly needed tax dollars. The Bipartisan Budget Act of 2018, extended 29 tax provisions through the end of 2017, after they had already expired. The Joint Committee on Taxation estimates these retroactive windfalls cost $10 billion over the next 10 years. It would have been better to provide a one year extension for activity taking place in 2018 so at least some marginal incentive effect to change behavior would have been possible. Many economists noted that the reduced tax rate on the deemed repatriation of previously deferred foreign source income upon moving toward a territorial tax regime provided a windfall to multinational corporations that had already benefitted from significant US tax deferral. Instead of being taxed at the prior 35% corporate tax rate, they were not even taxed at the new 21% corporate tax rate. The deferred income is taxed at 8% if held in illiquid assets and 15.5% if held in liquid assets, plus can be paid in installment payments over the next eight years. At a five percent discount rate, the installment payment option reduces the effective tax rate by an additional 17 percent. Although the partial recapture of previously untaxed foreign income is estimated to raise $339 billion over 10 years, the revenue gain could have been considerably more without adverse economic effects. With the U.S. now entering a period of annual trillion dollar deficits yet still facing significant social needs, including funding opioid treatment and prevention and deteriorating public infrastructure, policymakers should make every effort not to waste tax dollars with retroactive windfalls. Unfortunately, the recent tax and budget bills are examples of distorted and wasteful priorities of our politicians providing windfalls to special interest groups. The Tax Cuts and Jobs Act (TCJA) of 2017 is often compared to the Economic Recovery Tax Act with respect to major reductions in individual and corporate income tax rates plus accelerated depreciation. 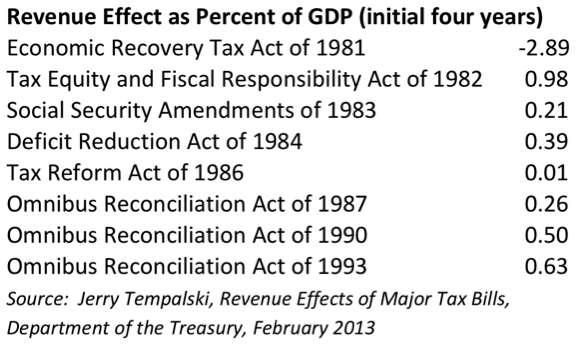 The 1981 tax cuts averaged -2.9% of GDP during the next four years. President Reagan and the Republican Senate became concerned with large future deficits just the following year. During the remainder of President Reagan’s term, five tax bills increased revenues by 1.85% of GDP, offsetting 64% of the 1981 tax cuts. Two more tax increases along with spending reductions addressed projected deficits in 1990 and 1993. Since 1993, there have been tax increases in the US, except the Affordable Health Care Act of 2010, and then only 0.2% of GDP. The 1980s’ tax increases preserved the lower individual and corporate tax rates, and in particular inflation indexing of the individual income tax brackets. The tax bills reduced tax expenditures as well improved tax administration enforcement and information reporting, and included scheduled payroll tax increases as part of protecting the solvency of Social Security. In a balanced approach to reducing the potentially trillion dollar annual deficits, Congress has many tax options remaining. The TCJA embraced anti-base erosion and profit shifting (BEPS) protections as part of the international changes, and scaled back itemized deductions. However, the TCJA did not limit the many types of exempt and deferred investment income. The TCJA gave a pass to the oil and gas and real estate industries. It provided a new deduction for pass-through business owners without any changes in enforcement tools to reduce the current high rates of non-compliance. A limitation on multinational enterprises’ ability to overleverage their US affiliates was dropped in the final legislation. The tax benefits of LIFO and carried interest remain. Although the 2017 tax cuts average only 1.06% of projected GDP (yes, less than 40% of the Gipper's tax cuts, and the percentage will be lower to the extent the 2017 tax cuts stimulate GDP in the initial years), concerns about the rising budget deficits at a time of low unemployment and an aging population are warranted. Tax increases as part of meaningful deficit reduction are possible while still retaining the key features of the 2017 reforms. The US 2017 Tax Cut and Jobs Act (TCJA) made significant changes to the US international tax rules by lowering the federal corporate statutory tax rate to 21%, enacting a territorial dividend participation exemption, and including several anti-Base Erosion and Profit Shifting (BEPS) provisions. Pascal Saint-Amans and I had previously called for a lower US corporate tax rate with a “tough” territorial regime. This is my initial assessment of how the 2017 US tax change has addressed the significant profit shifting out of the U.S. The table below compares the 2017 US tax changes to the key G20/OECD BEPS Action recommendations. The US rules closely followed the BEPS Action 2 (hybrids), Action 3 (CFCs), and Action 4 (Interest). Even more significant than these specific anti-BEPS provisions is the reduction in the US federal tax rate, which reduces the top combined federal and state statutory marginal corporate tax rate from 38.2% in 2017 to 25.8% in 2018. Instead of the U.S. having the highest corporate tax rate among all developed countries and all OECD countries, the US general tax rate in 2018 will be lower than the tax rates of countries accounting for over 60% of non-US OECD countries’ GDP. Although the 2017 tax changes reduce the incentives and place limitations on profit shifting out of the U.S., US multinational enterprises (MNEs) will still have some incentive to shift some profits out of the U.S. to benefit from lower tax rates in some other foreign countries. In particular, US transfer pricing rules were not significantly changed by the 2017 legislation, and remain a potential weak link in the tighter anti-BEPS rules. The GILTI and BEAT provisions were estimated to raise $262 billion over 10 years, and some of the $253 billion from the interest limitation would be from MNEs reducing overleveraging US affiliates with debt. The Joint Committee on Taxation did not separately estimate the revenue effect of reducing BEPS due to lowering the US tax rate. One unintended effect of the anti-BEPS provisions will be an increase in measured US Gross Domestic Product. BEPS has reduced measured US corporate profits, while increasing import prices into and lowered export prices out of the US due to transfer mispricing and other MNE tax planning. The reduction of BEPS out of the U.S. will increase measured US GDP, even if there is no increase in real GDP from higher capital investment or increased labor supply. As a simple example, if the U.S. was losing $100 billion of corporate tax revenue annually, then BEPS could have reduced US GDP by 1.5%. If the 2017 tax change reduces BEPS shifting out of the U.S. by one-third, this could increase measured GDP by roughly 0.5%. If the lower US general and “patent box” tax rates encourage some shifting of BEPS into the U.S., then measured GDP could increase even more. In comparison, the JCT estimated that the 2017 tax change would increase GDP by 0.8% over the 10-year period. I’ve updated the unweighted and GDP-weighted average OECD general corporate tax rates for 2018, including the lower US tax rate, in the table at the beginning of this blog. The US change makes little difference in the unweighted OECD average tax rate, but results in a significant drop from 31.5% in 2017 to 26.3% in 2018 on a GDP-weighted basis. The variation in general tax rates across countries falls sharply with the US tax rate reduction, which is a driver of overall BEPS shifting. A similar reduction in the average and variation in “patent box” statutory tax rates also occurs between 2017 and 2018. Bottom-line: The US tax changes will reduce the incentives and opportunities for BEPS out of the U.S., but there will remain significant opportunities for MNEs to lower their overall effective tax rates through profit shifting. Continued focus on harmful tax competition, greater transparency and tighter transfer pricing rules, and implementation of the G20/OECD BEPS minimum standards (and some of the other Actions) by all members of the BEPS Inclusive Framework are needed. The fight against BEPS should remain a high priority of the international community, including the U.S.
Tax reform or simply tax cuts? The Tax Cuts and Jobs Act passed Congress yesterday. As with any major legislation, the new law includes some beneficial changes, some bad tax policy, and especially missed opportunities. It is not the last word on US federal tax policy. After President Reagan’s 1981 tax cuts, he turned around and supported significant deficit reduction and loophole closing tax legislation in 1982 and 1984, and also a revenue-neutral tax reform in 1986. The bill’s ten-year revenue loss totals $1.5 trillion. The modest positive economic effects from deficit spending and certain tax reductions could alternatively have been achieved with needed government infrastructure spending that would also reduce the costs of doing business in the US. The beneficial tax reductions could have been financed with beneficial tax base broadening. According to the Congressional Joint Committee on Taxation’s (JCT) revenue estimates, the bill includes provisions with $5.5 trillion of gross tax reductions and $4.0 trillion of gross tax increases. The bill costs $2.5 trillion from reductions in individual (-$1.2T) and corporate (-$1.3T) statutory tax rates. Some people have asked whether this legislation should be called tax “reform”. My answer is a qualified yes. The move to a “territorial” tax system with recognition that tougher anti-base erosion and profit shifting rules, plus some reduction in the corporate tax rate, were badly needed and are a significant fundamental tax reform. The increase in the standard deduction and tighter limitations on various itemized deductions is along the lines of lower rate, broader base reform. The legislation, however, is a significant deficit-increasing tax cut, and creates several new tax expenditures (government subsidies provided through the tax system in the form of special lower tax rates or exemptions). The 20% deduction for certain qualified pass-through business income and reduced rate on certain foreign-derived intangible income (e.g. type of “patent box”) are new and complex tax expenditures. The legislation also moves away from a net income tax by adding further limitations on the use of business losses for both active partnerships and corporations. 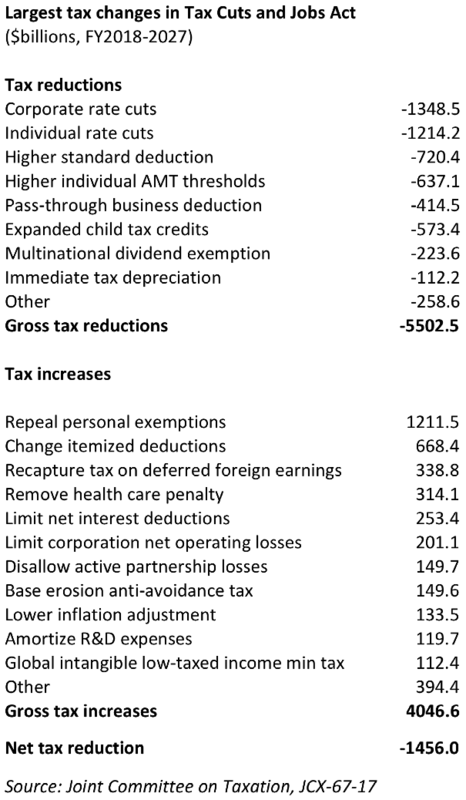 The table below shows the legislation’s provisions with the largest tax reductions and tax increases. Besides a tax cut disproportionately benefiting the well-to-do and which will burden our kids and grandkids with higher debt, the legislation missed an opportunity to do significant tax base broadening by reducing the largest tax expenditures. If the legislation had been revenue neutral from additional base broadening, then it would clearly have been tax reform. The legislation did not touch the three largest tax expenditures: exclusion of employer-provided health insurance ($3.0T over ten years), exclusion of pension/IRA contributions and earnings ($2.5T), and lower rate on dividends and capital gains ($1.6T). Meaningful reductions in any of those tax expenditures could have made the legislation revenue neutral and with a fairer distribution. Tax expenditures in the US are very large, totaling as much as current income tax collections. Lowering corporate and individual tax rates will reduce tax expenditures given in the form of lower rates, exemptions, exclusions and deductions. Overall, I would expect the US tax expenditures on net to decline after the legislation from rate reduction, rather than from base broadening. The US does a good job of measuring and monitoring income tax expenditures with annual reports by both the Congressional JCT and the US Treasury. I’m pleased to be working with the Switzerland-based Council on Economic Policies (CEP) in an effort to improve tax expenditure reporting globally. A new IMF blog with Agustin Redondo of the CEP presents some preliminary results from a new Global Tax Expenditure Database. Tax cut vs. tax reform? The new bill is both, but 2017 was a missed opportunity for more significant tax reform. Future federal income tax reform is needed, and perhaps 1982 and1984-style loophole closing deficit reduction legislation will follow this new legislation. Focus on future deficit reduction should not be limited to just direct spending reductions, particularly after this $1.5 trillion tax cut. I had the pleasure of speaking to students and faculty at Washington State University about federal tax reform, thanks to the Hoops Institute, the Foley Institute and the Carson School of Business. The talk was Wednesday night when the Senate began its deliberations on tax reform. The talk was very timely, and how sausage, I mean legislation, is made has been in clear view. The one hour presentation and Q&A was videotaped and can be seen by clicking here. Tax reform is still a moving target, but the House and Senate Finance Committee legislation have much in common so it is a highly likely that there will be tax "reform" in 2017. Two key messages I hoped to leave with the students. First, although the media and lots of people focus on the politics, process and personalities around tax reform, our tax system and tax reform legislation reflects our politicians' (and thus our country's) social and economic values. Tax reform reflects the trade-offs between economic growth, efficiency, fairness, simplicity and certainty. The Republican majority that is passing this tax legislation has made trade-offs with respect to current vs. future generations in terms of using deficit financing, between growth and fairness as shown in the JCT distributional tables, and between stability and uncertainty with its choice of sunsetting most of the individual tax changes. Those values are different than mine. Second, elections matter. Our democratic process has provided us with the current President and current Congressional majorities that are voting for this particular type of tax legislation. There will be elections in 2018 and 2020, and voters will be able to decide if this type of tax legislation reflects their social and economic values. In the presentation, I stress several positive features of the current tax bills, especially the need to have a more competitive corporate tax rate and strong anti-base erosion and profit rules. However, the current legislation is a serous missed opportunity for our country, especially if we are going to use a trillion dollars in tax cuts instead investing in needed productive infrastructure, while doing minimal base broadening of the major tax expenditures on the individual side. I stressed that each person has to make their own assessment of the trade-offs between growth, fairness, and simplicity, and then vote accordingly at the next opportunity. Any major legislation will have obstacles and roadblocks, and in the case of tax reform likely some near-fatal experiences. The media has focused on differences between the Ways and Means (W&M) Committee tax legislation and Senate Finance Committee (SFC) Chairman Hatch’s initial proposal, namely differences in the treatment of state and local property tax deductions and a one-year delay in the corporate 20% tax rate. Those differences are relatively minor in the Republican Party’s desperate desire to have one major legislative victory before the 2018 elections. Below are five more significant issues that could determine the fate and timing of federal tax reform in 2017 or 2018. Deficit increases not offset significantly by economic growth. The $1.5 trillion increase in deficit is a concern of several Republican senators, given low current unemployment and large future deficits from baby boomers’ retirement and health programs. When JCT and CBO complete their dynamic fiscal estimate, it may show only a small reduction in the estimated static deficit. This may be why the House will vote even before the dynamic score is finished. Byrd rule preventing long-term deficits. Senate rules don’t allow a majority vote if legislation increases the deficit beyond 2027. This required the Bush 2001 tax cuts to be sunset after 10 years. The SFC Chairman’s mark has large deficits in 2027, so the Chairman’s mark will need to be changed drastically to comply with the Byrd rule. Sun-setting corporate tax cuts will make the dynamic effects even weaker, and make the proposal less attractive to many. Distributional issues and weak middle-class tax relief. JCT estimates do not distribute the estate tax cuts (see 11/5/17 blog), thus understating the benefits to the wealthiest. The JCT estimates that W&M legislation increases individual income taxes on average for the $10-40k income classes in years 2023-2027. Is that tax relief for hard working, but lower income, Americans? Business tax cuts may be whittled away as they try to make the package more appealing to households. During the W&M Committee legislative changes, Republicans increased deemed repatriation tax rates and retightened the related party payment rule to reduce the business tax cut to provide more household tax cuts. At some point, more of the business community might say it is not beneficial to their industry. Refundable tax credits. Several Republican Senators are not supporters of refundable tax credits (low-income “welfare” through the tax code, rather than corporate welfare). Much of the tax reduction for some low and middle-income families is due to larger refundable tax credits. With a narrow margin to get 50 Republicans, this could be the tipping issue for at least one Republican senator. There will be other obstacles raised and pre-mature death warnings as the legislation goes through the SFC, the House and Senate, and a conference committee. Still I predict legislation called tax “reform” will be enacted in early spring of 2018, although scaled back to a smaller version with more of the tax cuts going to non-business households. Stay tuned. Distribute all the tax cuts! 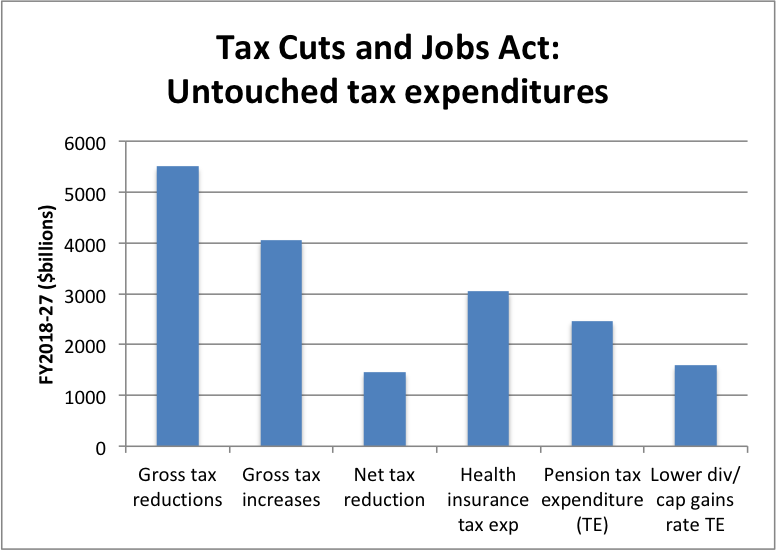 Given that the eventual repeal of the estate tax in House Ways and Committee Chairman Brady's tax reform proposal accounts for 12% of its total net tax cut over ten years, and 29% of the total net tax cut in fiscal years 2025-27 when the estate tax is repealed, this is a serious omission from the JCT distribution tables. The IRS Statistics of Income has published tables linking estate tax returns with the income tax of married decedents in the prior year, which provides important information about the income of estate taxpayers. The table above shows that decedents with taxable estates in excess of $10 million had an average income in excess of $1 million the year before their death. Decedents with taxable estates over $20 million, accounting for over half of the estate tax paid, had an average income over $4 million. The description of the US Treasury distributional analysis, as of 2015, said that "Ninety-one percent of the estate and gift tax burden falls on the top 5 percent of families, with 43 percent on the top .1 percent of families." Revenue and distribution tables are based on estimates and projections by career professional staffs. If the Congressional government staffs can distribute corporate income taxes and make 10-year revenue projections, their distributional tables can also include estimates of the distribution of estate taxes.